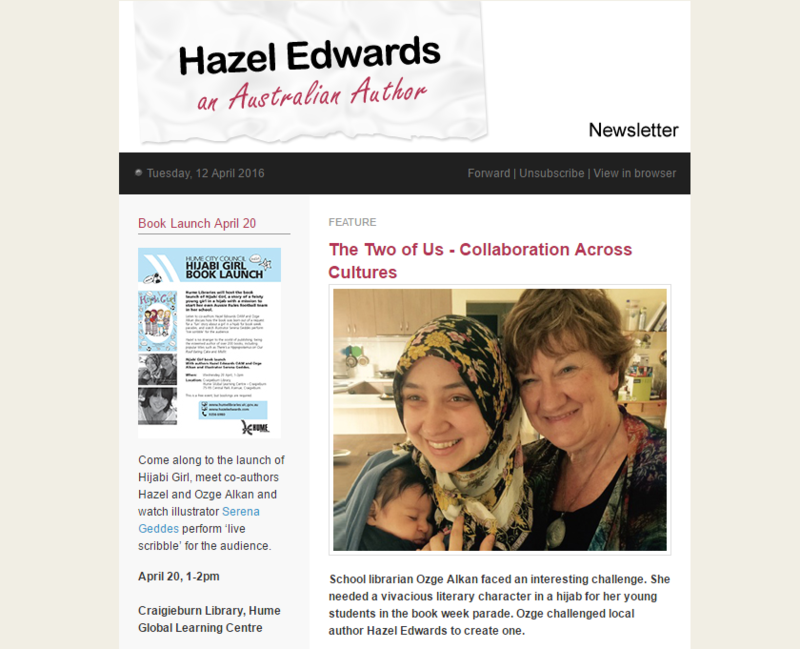 Utilise a range of resources, perspectives and tools for aspiring writers, teachers and literacy fans by downloading earlier copies from the newsletter archive. 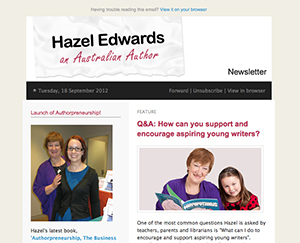 How to support aspiring young writers. To E or Not to E? 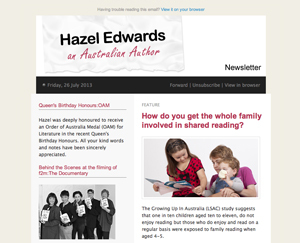 How do you get the whole family involved in shared reading? I will admit, when I first heard about electronic books, I had my reservations. How could you replace the tactile pleasure of curling up with a book, licking your finger to turn the page and transporting yourself into another world? And why would you want to? For those who know me well, one of my vices is reading in a bubble bath and the thought of electronically fusing myself was not appealing. Yes, I have a few damp books (don’t tell the librarians!) but I am still standing without frizzy hair. Today I am an e-convert. 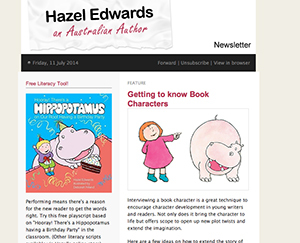 As a reader-consumer, the accessibility and cost of e-books is extraordinarily appealing. For a frequent traveller, they weigh less. As an author-educator, the speed of production, breadth of distribution and additional resource material ebooks offer is professionally attractive. As a national reading ambassador, I recognise the potential that ebooks offer to encourage literacy at any age and within both local and remote markets. During the same period, sales of hardcovers fell by 11.3% to $49.1 million, while paperbacks fell from $56.4 million to $39 million. E Books increased by 169.4%. 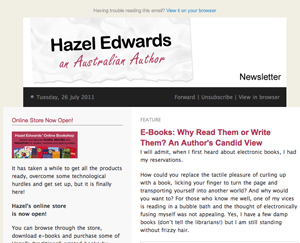 Australian figures are less in total, but the e-book trend is similar. Yes, I have a book-lined study in which I’m keying this. I still love their look and feel. 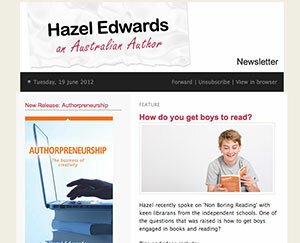 But as an author and reading ambassador, I recognise that I am not in the business of books. I am in the business of stories and ideas. And one definition of intelligence is the ability to adapt to your changing environment. So, I need to adapt my reading style. I am already an audio book listener on long car drives, electronic is just another method. E. is not exclusive, it is inclusive. There's not one form of e-book, nor one way to read electronically. 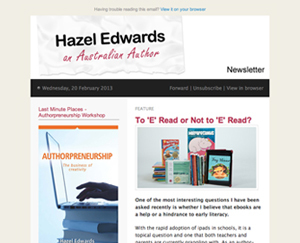 E books may not be the best method of providing your favourite kind of book and not all Australian titles are available for all devices. People are apprehensive. Which device should you buy? With recent bookstore closures, comes realisation that if you are too closely tied to a reading device which works only with their system, you are limited. 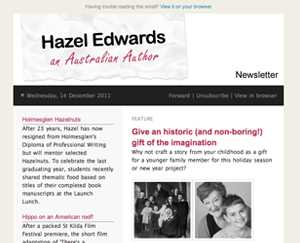 Okay that some multi-nationals are offering out of copyright ‘free’ classics, but what about accessing and paying for Australian e-books? I can see that certain genres such as travel guides, ‘how- to’ manuals and popular fiction have a natural fit with an electronic platform and suit early adopters. But it is not just about being fashionable. The biggest, long- term implication will be Literacy. Picture books formatting still has a way to go on some handheld devices and is crossing over to games and Apps. (T-shirt & card merchandising of my characters like Project Spy Kids and Frequent Flyer Twins is already happening. http://www.janeconnory.com/p/gift-shop.html.) The potential for dual language is there especially in the teaching of English as a second language, with audio options to ‘hear’ how it might be pronounced too. ‘Literacy mysteries series’ for junior ‘discovering’ readers is a niche which attracts me. ‘Project Spy Kids’ stories, set around my sleuth hero Art, the resourceful problem-solver who has reading challenges, is my experimental e-area. So are my print- proven, Frequent Flyer Twins series about Asian Australian 10 year olds who solve mysteries at various international airports. Mysteries encourage discovery reading and the junior chapter novel is accessible and shorter, but with series potential. 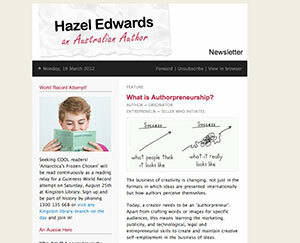 From an author perspective, niche e-publishing is possible. 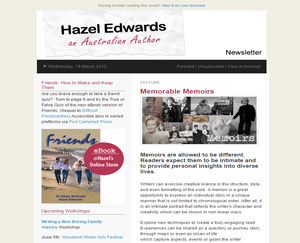 So my recently updated ’ Writing a Non Boring Family History’ also has an e-edition including hints on how to e-publish your non- boring family history. Family historians may benefit from being able to publish their limited edition digital books with family photos , maps & cartoons, so international relatives can share. 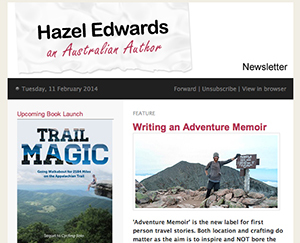 This will be e-self-publishing, not vanity and will have cultural significance. We are in the business of ideas and stories and can’t be myopic about that. Quality control. E-books still need editing and proper design. More emphasis will be upon the cover, title and one line blurb,as the only clues. Distributors tend to see e-books as ‘product’ in numbers sold. Certain authors and publishers are at the mercy of the technological skills of those e-converting their books, without opportunities to check final versions. Access to ideas matters. E-books are provoking discussion about the ways ideas ‘should’ be available. Technological censorship via ability to delete or share may become an issue. Accountability for the number of copies made? Costing. What’s a reasonable amount to expect to pay? The content is still probably an author’s year’s work. 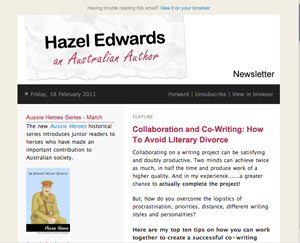 Like many authors, I provide some ‘free’ resources on my website, but I expect my core work to be paid for, i.e. human readers pay for the book or script. How can the ‘originators’ of ideas be appropriately paid? Multi-media rights are complicated, especially if visuals and music are included. 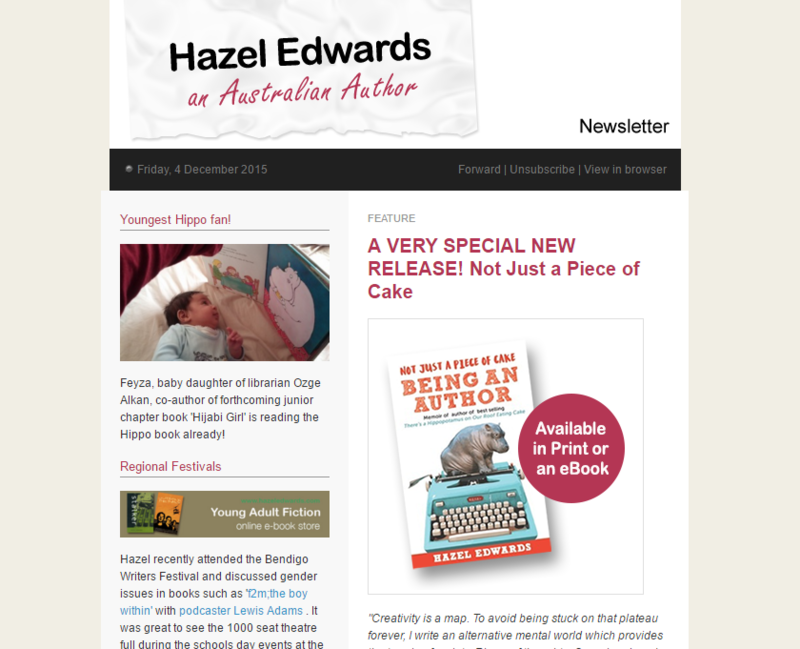 Some of my e-books such as ‘Sir Edward ‘Weary’ Dunlop’ , ‘f2m:the boy within’ and ‘ Duckstar’ are available via conventional print publisher links to Amazon, Readings etc. As an author-educator I provide extra resources like discussion questions , book trailers, reviews, activities & curriculum links concentrated on the one site. Popular topics like Antarctica or family- history link because I write in varied formats, so there's the BONUS of finding unexpected , relevant stories in new formats like classroom playscripts based on picture books. Encouraging Literacy. Write Your Own Next Mystery in the series. Am I digital dinosaur? No, I have experimented with technology and love new ways to do things, faster. Probably I’m a digital émigré, in the sense of crossing over into a new culture. But I’m not a digital native, like children who consider screen reading the norm. 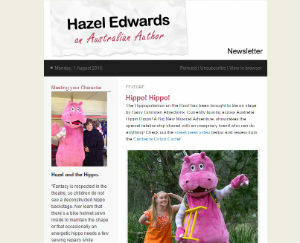 To download Hazel's e-books online visit Port Campbell Press.